UNStudio’s mixed-use Raffles City development is located near the Qiangtan River in Hangzhou, the capital of Zhejiang province, located 180 kilometres southwest of Shanghai. 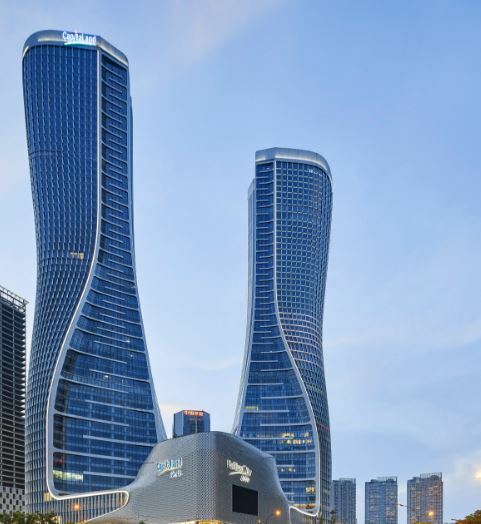 The development forms a prominent landmark in Hangzhou’s new central business district, with a total area of almost 400,000 square metres spread across the two 250-metre towers, the podium building and the surrounding plaza. “Raffles City Hangzhou will be a point of confluence,” claimed architect Ben van Berkel, “a hub for business conduct and a new destination for visitors and residents alike; an all-in-one destination for working, living and leisure in a highly sustainable environment.” The development in Hangzhou is informed by the firm’s focus on a concept it calls Superliving, which involves mixing different programmes in efficient structures that enhance the urban experience for residents and visitors. The two 60-storey high-rises contain apartments, offices, the Conrad Hotel and a rooftop helipad, all with views towards the Qiantang River and the city’s historic West Lake district. The six-storey podium contains shop units, restaurants, leisure facilities, parking and a direct connection to the metro transportation system, with a main entrance on a corner facing the adjacent park and city centre. The design of the project references the movement of the river in its fluid surfaces, which start out calmly at the base and then sweep dramatically across the exterior of the two towers. This dynamic aesthetic seeks to unite the diverse programmes contained within the complex. The towers are arranged on an east-west axis that minimises overshadowing and allows daylight to reach the apartments and offices.